For some people the thought of picking their own shares can be a little bit daunting. Rest assured, it doesn’t have to be. Whilst it is best to do at least a little bit of homework before you part with your hard earned cash, successful investing does not require a high IQ or lots of specialist knowledge despite the efforts of the financial industry to convince you otherwise. Armed with plenty of common sense and a few simple rules it is possible for just about anyone to put together their own share portfolio. You need to know how a company makes its money. If you can’t work this out then don’t invest. This is one of Warren Buffett’s simple rules that he has resolutely stuck to over the years. Most of us can understand what a supermarket company like Sainsbury’s does but might struggle to understand a technology or engineering business. It also pays to understand how a company’s profits have fared through good economic times and bad. You can find this out by studying its financial history. You might make a fortune buying the shares of an unknown small company but you can lose all your money as well as small businesses tend to have a higher failure rate. Sticking to the shares of established companies that have been around for a long time – such as those in the FTSE 350 index – is usually a safer bet. Profit growth is the key to making good money from shares. It is usually better to pay a bit more for a share with good growth potential than to buy a share that looks cheaper but cannot grow. This is because shares tend to be valued on a multiple (such as ten times or twenty times) of their profits. As long as the multiple isn’t too high (which can be a sign that a share is expensive) if profits can grow there’s a reasonable chance that the share price will too. A company needs to have a consistent level of profits and cash flow to pay a dividend to its shareholders. This makes dividend payments a good signal of company health. A company that has paid a dividend for a long period of time – say at least ten years – can end up being a better and safer investment than a company that has not. With the exception of utility companies – where their stable profits usually means they can cope with debt – avoid companies with lots of debt. Debt is your enemy. A company has to pay interest on its borrowings before it can pay any money to shareholders. The more debt it has and the more interest it has to pay the more risky its shares tend to be. If profits fall sharply, then debt can wipe the shareholders out. To avoid sleepless nights, buy shares in companies that can comfortably pay the interest on its borrowings. You might set a minimum interest cover (the number of times a company’s trading profits cover the interest bill) of at least five times for example. This means that you will worry less about the ups and downs of the stock market because there is usually more time for good times to offset bad times. Using your dividend income to buy more shares can be a great way to build up your nest egg. History has shown that dividend income and its reinvestment has made up a large chunk of the money made from owning shares. This makes you less reliant on the stock market going up as well. Your ISA and SIPP provider can set up your accounts so dividends are automatically reinvested for you. You should look at companies in the same way as you look at savings accounts. Ones that earn high rates of interest on their money invested (known as return on capital employed or ROCE) tend to be good businesses. Do this by aiming for a ROCE of at least 15%. Companies can be profitable but generate very little surplus cash. Cash is the lifeblood of any business. Without it bills and dividends cannot be paid. Avoiding companies with consistently weak cash flow is usually a good thing to do. Look for companies that can turn at least two thirds of their profits into cash. This is probably the biggest mistake that investors make. Too often, paying too much for the latest hot share is the road to losses when expectations of big profits are never met. Avoid this pitfall by setting yourself a rule for how much you will pay for a share. For example, you could set a limit of 15 times current earnings (a PE of 15) or 20 times ten year average earnings. Whatever rule you set, stick to it. 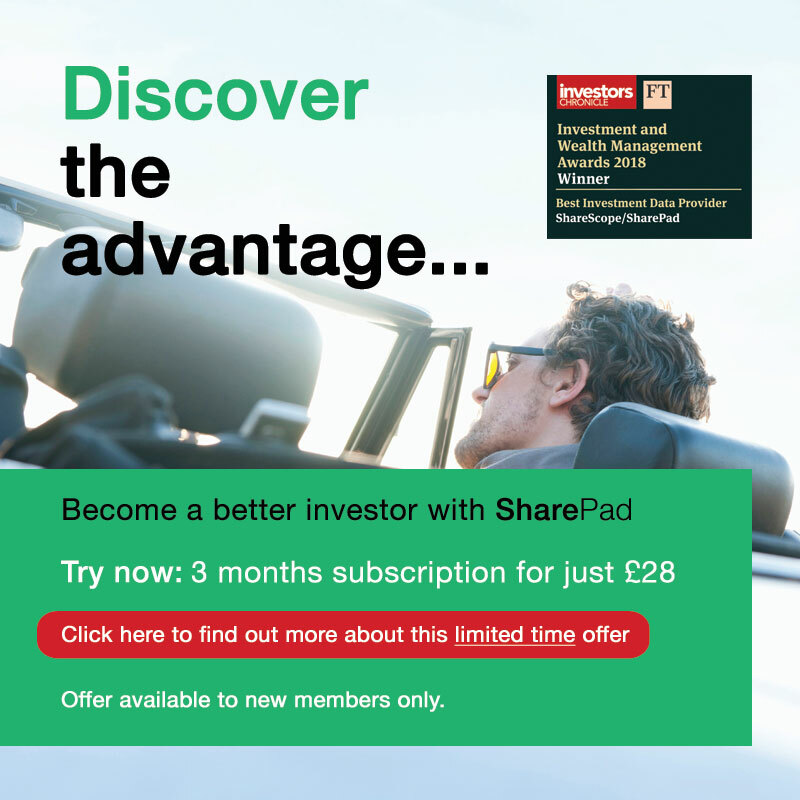 If you are going to manage your own investments, you should seriously consider subscribing to suitable investment software like SharePad or ShareScope to help you find attractive investment opportunities. 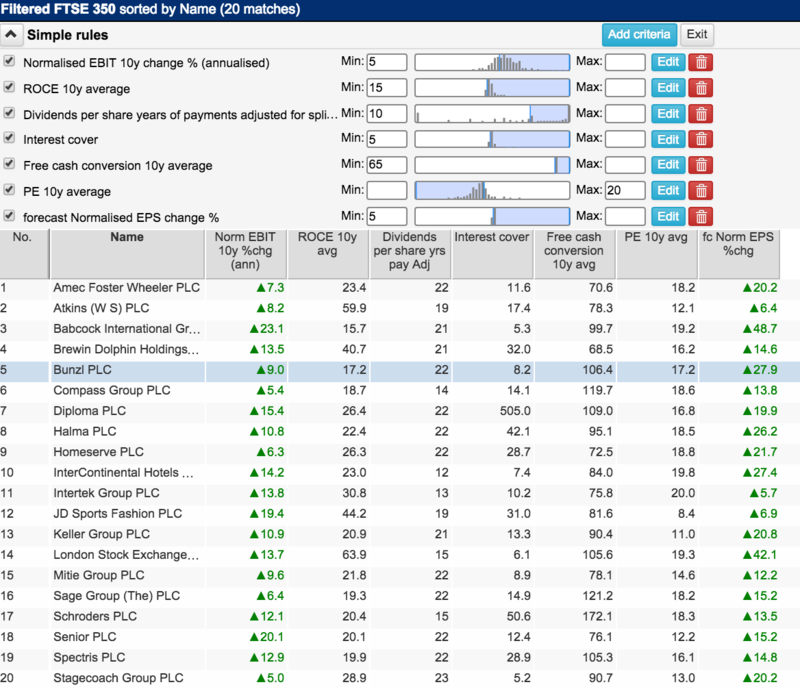 For example, SharePad has filtered the FTSE 350 for stocks which meet the criteria above and found 20 matches. Of these, it is pretty easy to understand the businesses of JD Sports(sports clothing retailer), Stagecoach (public transport) and Inter-Continental Hotels. Alternatively, your broker’s website may help you find out some of the information – like dividend record and profit growth. Once you have identified some interesting-looking shares, call your broker and ask them about the more in-depth items such as interest cover, free cash conversion and returns (ROCE).